It’s almost October, which means that for the past couple of months, I’ve been busy perfecting our new fall specials. One of our new features is the “Mile-High Meatloaf,” and I thought a little background on the history of meatloaf would be in order. Nobody knows exactly when meatloaf was first created. Early records show that for centuries, cooks would mince already-cooked meat by hand and re-form it into molds. Some even believe that meatloaf has its origin in scrapple, a mixture of ground pork and cornmeal served by German-Americans in Pennsylvania since Colonial times. But it wasn’t until the Great Depression and World War II that the American public began incorporating ground meat into family meals on a widespread basis. It was critical for families to stretch food dollars as much as possible. Using an inexpensive ground meat and throwing in leftovers and other less-than-fancy ingredients along with a few spices gave cooks a way to use up things that might otherwise go to waste. This is the reason we all feel that our mom’s meatloaf is the best. There are as many different variations as there are families and generations. Today, many hail meatloaf as the ultimate comfort food. Because of its appeal as a traditional family dinner, Americans are ordering meatloaf at restaurants in record numbers. For that reason, I invite you to try our Mile-High Meatloaf. We’ll fill your need for comfort food with four slices of our private recipe meatloaf served over a grilled slice of homemade Italian bread. To make it a Mile-High, we top it with two large scoops of fluffy mashed potatoes, savory beef gravy and crisp onion rings. You really have to see it (and eat it) to believe it. 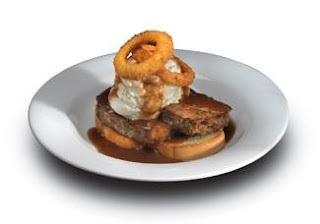 The Mile-High Meatloaf will be featured at Eat’n Park from Monday, September 29th until Wednesday, November 26th. It is a limited time offer, so be sure to stop in and give it a try. Then come on back to the blog and let me know what you think.